Going into hospital was fantastic for getting loads of work on my crochet projects done. I finished one project, hooked through more than 30 squares for my blanket, then started and finished a warm ripple lap blanket for mum. Cookie loved the cuddly red and white blanket, so it got shipped to mum along with a lot of cat fur. Reading or writing wasn’t an option in hospital with chatty room mates, but I could talk and crochet at the same time. The hospital staff loved seeing the blanket grow quickly, but were a bit horrified to see it complete at the end of my second stay. At home though, there is work to do. Photo assignments to shoot, cooking, washing, cleaning, shopping, gym and physio to go to, and so many doctors appointments and tests to attend. After so much activity plus the battle with the ongoing methotrexate side effects and migraines, I am pretty dead. It’s meant any crafting got put aside. I have a couple of projects that need to get done – one a promised present for a 5 year old. The intended recipient was upset when her younger sister received a quilted cross-stitch hedgehog pillow I’d made years ago for Christmas, and requested a dinosaur one for herself. Not just any dinosaur – it must be herbivorous. Preferably a brontosaurus. There are very few dinosaur cross stitch patterns out there, especially of dinos other than tyrannosaurus rex. As I’m not comfortable making my own patterns from scratch, it took weeks to track down a cute-enough brontosaurus for a 5 year old. Then a few more weeks to choose a colour palette and make a start. As cross stitch is hard on my hands and wrist, I procrastinated. Then I did a couple of marathon sessions and hurt my hands. And procrastinated some more. I was happy when Michael Nobbs started a gentle challenge over on Sustainably Creative – just 20 minutes a day on one creative project. The accountability provided just the prodding I needed to get moving again, and keep moving forward, a little each day. Although, I have not done exactly 20 minutes each day, rather stitched until the end of my thread. 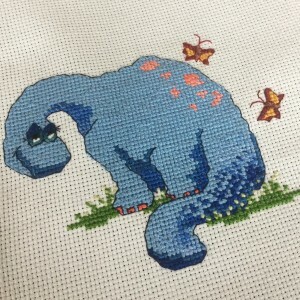 We are half-way through the two week challenge, and the dinosaur cross stitch is finished. The next step is to purchase quilting materials and turn it into a quilted pillow. With a bit of luck to find appropriate quilting fabrics tomorrow, and 20 minutes of work per day, it will be ready for an Easter present next weekend. Then I can start again with a green stegosaurus – I have another hedgehog to gift next Christmas and I don’t want to be the cause of any fights between the sisters! The accountability and excitement of seeing what the other challenge members get done each day is so useful to get past my terrible procrastination habit. Cathryn – on working at a gentler pace and working alongside each other. Laureen – on persisting and allowing creativity to win, even when going for walk. Michael – on the magic of 20 minutes. Josh – on sychronicity and a challenge. Getting past the procrastination on the cross stitch has had the happy and surprising side effect of prompting me to work a bit on the other presents in my crochet and sewing queue. What creative projects are you working on? Do you do a little each day? Do you struggle with procrastination?